K. Bell has released a line of Grumpy Cat socks. Grumpy Cat is a popular Internet celebrity cat known for her grumpy looking demeanor. However, she (Tardar Sauce) is actually a very sweet kitty according to her owners. The socks are available in several styles for men and women. Karen Bell, founder of K. Bell, says in a statement, "K. Bell is thrilled to be partnering with Grumpy Cat for this latest sock collection. We are a contemporary brand that aspires to stay on the pulse of pop culture so this partnership with Grumpy Cat only makes sense as she has global popularity and appeal." The styles include a Christmas sock that says "The Most Terrible Time of the Year" and features Grumpy wearing a stocking cap. 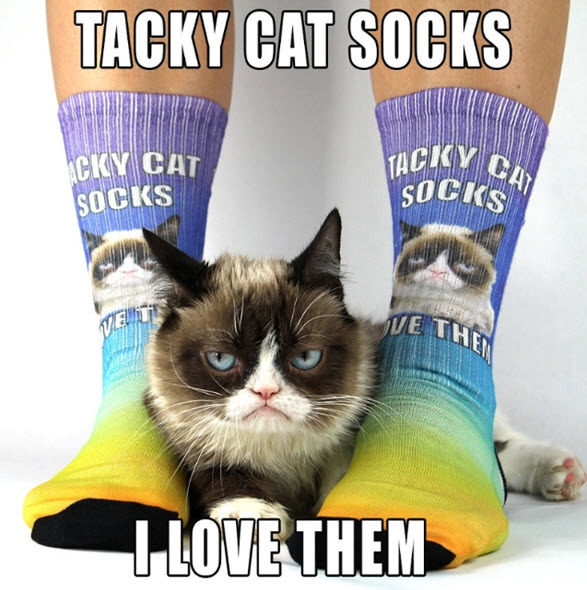 There are also USA and shamrock themed Grumpy Cat socks. Another pair has little paw prints all over it. You can find the collection on kbellsocks.com. The socks sell for $12 each. There are also packs of 7 pair available for $79.95.